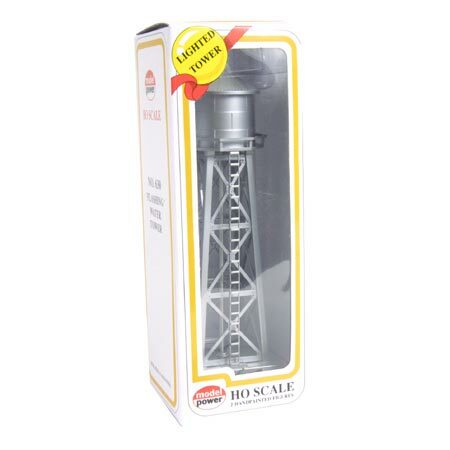 This HO Scale Flashing Water Tower is Lighted and Fully Built Including Two Handpainted Figures. A Model Power Product for Those Age 14 and Older. Compatible with and complements any HO scale model layout. The tower is constructed with plastic parts. The tower is mounted to a silver square base. The siver tower has a ladder reaching up to a ledge around the tower. The cone-shaped top of the tower has a red flashing light. Two handpainted figures are included with the tower. One of the figures is a lady in a red dress and the other is a man wearing a brown coat.